Whoa, I’m impressed. 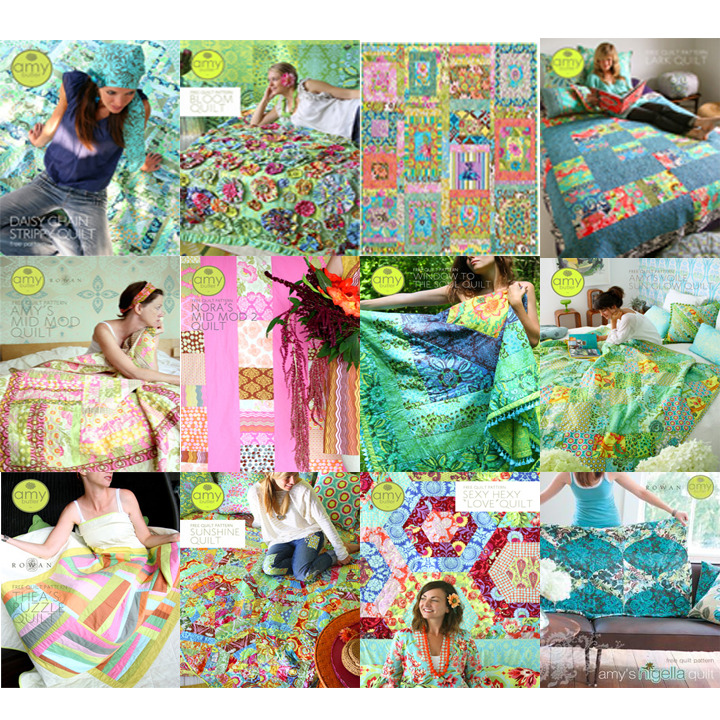 Photoshop Elements Version 10 really allowed me to show you some of the free patterns that Amy Butler has to offer on her website for quilters. I’m not a quilter, but I know there are lots of you out there. And maybe one of the quilts shown above might interest you. To get these free patterns, visit Amy Butler’s site. Go to the free patterns and download the PDF formated file. Each file consists of instructions and measurements. Dew Drop Sling, oval shaped with a long needle and cellphone pocket on the outside, two larger zippered pockets on the inside to hold yarn and other essentials. It has a wide shoulder strap for a more comfortable feel. Diana Sling which is a modern, playful bag. It has roomy spaces, as she has created a zippered center pocket. There are several tool channels and a cellphone zippered pocket. The bottom has an expanded panel with a soft comfortable shoulder strap. The Pearl bag is is very stylish and practical. One side of the bag has three pleated pockets. There is a zippered inner pocket allowing for more than one project, thus organization. I can see using this bag as everyday use, not just for those crafty days. Check out her other Sweet Life bags, the Hampton and Sanibel. I can’t wait for Amy’s new field bag and tote. I “love” her bags and have almost everyone that she has designed, including her free project ones. I like her mini dress tunic & top pattern. It sure will be a hit with the younger set and will be prefect for the upcoming season. Amy is coming out with her first CD software program. It runs on Windows XP, Vista and MAC systems running Windows program (woo hoo). There are 22 projects with 9 bonus projects. You can make the projects as designed OR you can customize her projects with a program using the software tools. Just think of the possibilities of her bags you can design to your liking. She has included in the CD clear step-by-step instructions for each skill leveled sewer. And if help is needed, you can contact the Electric Quilt support team. Now all I have to do is make sure my MAC is running the windows program! Click the photo to the left to view a slide show of projects. Now to move on to the contest. I have more to share, but I will post more tomorrow on “What’s New with Amy”. The Mid Mod Contest runs from June 1st through September 15th. To see rules click on the photo to the left. This contest marks the one year anniversary of Amy’s Rowan Midwest Modern fabric line. All you need to do is make a project using Amy’s Midwest Modern fabric. The project can be one of Amy’s patterns, one of your favorites or an original item you have created. There will be 10 winners announced and Amy is putting together a Flickr account for all entries from her website. 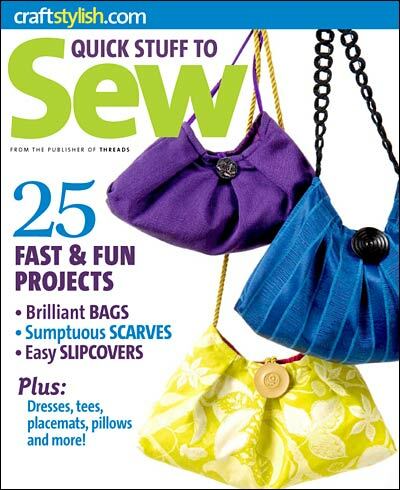 The winning entries will receive fat quarters from Amy’s line, Midwest Modern, a signed copy of Amy’s software and a great selection of her newest sewing patterns. So time to get stitching. I’ll have to figure out what fabric and item I wish to enter into the contest. There is a magazine coming out on December 9th. Its called Quick Stuff to Sew. I don’t know if you can get this magazine from JoAnns or not but I am on the look out for it because of the quick and easy purse patterns. They are really cute aren’t they? Very simple too! Craftstylish.com puts this magazine out and I missed the first volume, but can still order it. I checked Amazon.com, but they are all out of the Spring issue. So for right now I’ll just sit on my hands and wait. If I can’t wait I’ll order from the direct source and pay a shipping fee of 3.99 (yikes). Have any of you seen the templates for the bag patterns that Nancy Zieman came out with that Clover now sells? Its called Trace & Create. It runs for 19.95 and comes out in two different styles. You have the Town & Country Bag and then the City Bag. They are sold individually. I was going to enter a contest to win these items from SewNews, but I didn’t get my entry in soon enough. Here are what the templates look like. Sorry they are so small but I couldn’t enlarge the diagrams. You can make up to six different designs, but then again you could go wild. The blue templates, is the City Bag Collection. Comes with two templates; main pattern and flap. If you’ve ever made tote bags before, that is simply what the City Bag Collection is. It shows you on the template where to place straps/handles, darts, pocket on the inside lining, and gives you 2, 3, and 4 inch placement for creating your side/bottom of the bag. You can also just make the tote flat. Pink templates, the Town & Country, 3 templates, main, gusset and flap. As with the City Bag, you can create a flat purse. The template shows where to place darts, or a series of gathers, the gusset, flap and handles. This would be great for the beginner. As I saw a closer look in SewNews, I got ideas, but don’t need the templates to make. I really do like making purses and I have to get back into making them. I was suppose to work on that apron this week-end but I never got to it. We went out and bought our daughter her b-day present (flat screen tv with DVD player attached) and then other crap. Then when we got home I had to run back to the store cause the wireless mouse I bought wasn’t MAC friendly and the American Flag wasn’t one that slid on the pole. So as I was shopping the second time around without hubby, I made more purchases and got what I was suppose to. Got home, missed our son a second time and wondered why “our” tv was sitting on the floor (thinking my hubby took our daughters out of the box) but “no” our son went out and bought us a flat screen tv for Christmas. What a wonderful kid!!! He said he couldn’t stand watching football with lines across the top. I was in agreement with him, yet old man couldn’t see any lines. Last night I made fun of hubby and today both son and I kept telling dad that there were lines, son even plugged it in again. He still didn’t see them. We both told him to take his postcard from the eye doctor and get new glasses. Well this week is a 4 day work week. I have to use up some of my 15 vacation days. So for the next 2 weeks they’ll be short. Work a full week, then I will have 3 more weeks of 2 or 3 days. Then I’m carrying over 8 days. I’ll be able to work on that apron in the next 2 weeks. Possible craft show week-end of Thanksgiving and then one in December. OMG – I forgot I got a envelope from London. Lisa Lam, u-handbag, sent me my prize pattern of Amy Butler. Gotta run and open it up.